In Forgotten Gods, Acolytes must uncover the origins of the corrupted xenos artefacts plaguing the sector and the dark cult that seeks these objects to empower its unholy rituals. As they travel across Desoleum's lawless wastelands, the black depths of space, and finally to a mysterious, bone-strewn cemetery planet, it will take of all of the Acolytes' skills in both investigation and combat to survive and vanquish these threats! Gazetteer information on covering the wastelands of Desoleum, the Rogue Trader vessel Oath Unspoken, and the ancient shrine world of Thaur. Rules for creating player characters from these new home worlds. This is not a stand-alone game. 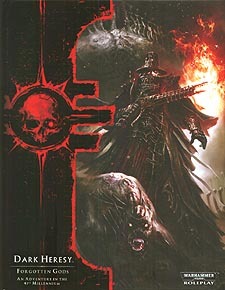 A copy of Dark Heresy (2nd Edition) Core Rulebook is required to play.